Chinese officials recently showed off the latest tool in their already impressive surveillance arsenal: facial recognition eyeglasses. Each set is equipped with bleeding edge optics and advanced facial recognition algorithms capable of pinpointing a single fugitive in even the most crowded of places: like a train station or airport. Snap Inc.’s ‘Spectacles,’ these are not. Released last year, the device has already undergone successful field testing at Zhengzhou’s East Railway. Authorities reveal the glasses are responsible for the capture of seven people wanted in connection with major cases, and 26 others traveling under a false or assumed identity — the stated use case for the glasses. The glasses are a speedy alternative to the fixed-position units often used at major transportation hubs or border crossings. With fixed-position facial recognition devices, the cost and slow speeds offer major drawbacks. By the time authorities recognize a suspect, for example, they often manage to blend back into a large crowd before officers arrive on the scene. Portability affords the luxury of never taking your eye off those suspected of illicit activity. And by storing the datasets on a hand-held device rater than in the cloud, authorities can work quickly in apprehending those suspected of wrongdoing. For all its benefits, the technology isn’t without its critics. 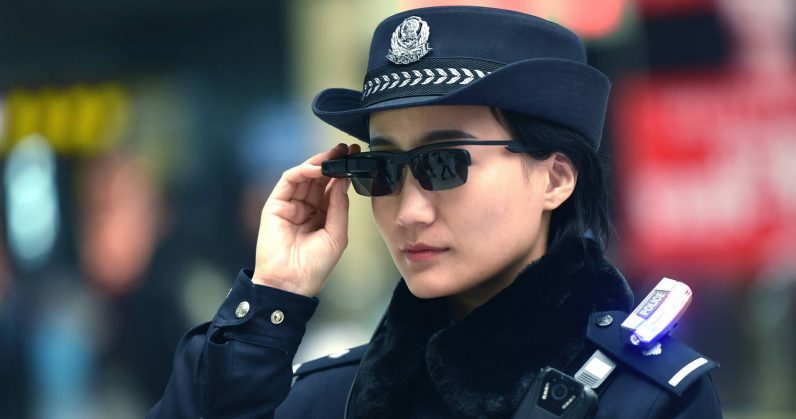 “The potential to give individual police officers facial-recognition technology in sunglasses could eventually make China’s surveillance state all the more ubiquitous,” said William Nee of Amnesty International in a comment to The Wall Street Journal. The technology could also make it easier to monitor political dissidents and ethnic minorities, says Lee. This in a country not exactly known for due process. China, remember, has been collecting biometric data on its citizens for years. It also has the largest network of surveillance cameras in the world. The dragnet approach to adding both suspects and citizens to a database that makes them instantly recognizable to authorities is firmly toeing the line with dystopian fiction. Or, perhaps the country has stepped over it completely.